In our last post, we began to look at the scandalous Grace of God. This Grace that turns a sinner into a saint. I since the impression to continue in this study of His Grace. I want to begin today by looking into our forgiveness. Just how forgiven are we? If we listen to the traditions of men, we would conclude we are only partially forgiven. If we listen to theologians we would conclude that we're forgiven but not really. They have coined phrases like "judicial forgiveness" and "parental forgiveness." Because religious tradition hasn't fully grasped the reality of the Finished Work, we get left with religious double talk. We are forgiven of our past sins, but not our present or future sins. For any current sins, or future failures we are left with maintaining a short account with God by our continual confession of sins. 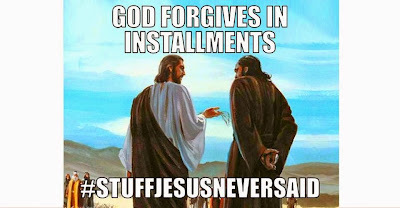 Another form of this religious double talk is this "judicial forgiveness" philosophy. It states we are forgiven but not really. We are forgiven but we are still accountable for our sins to God. Given the way religion views our forgiveness, we can see now why this Radical Grace of God is so scandalous. Grace declares from the Word of God, not from man, not from any religious tradition that we are totally forgiven. This scandalous Grace reveals that God hasn't just wiped our past clean, but has completely forgiven us of all our sins past and present and future. Certainly, this flies in the face of traditional religion. Many believers are comfortable with the idea of a forgiven past but not so much with the idea that we are forgiven of future sins, or the sins we have yet to commit. This is why this over the top Grace is so scandalous for it takes away all of our sins, (here.) Religion resists the idea that we are completely forgiven. They wrestle with reconciling 1 John 1:9 (confess your sins to receive forgiveness), with other passages that declare we are forgiven of all sin, (see here, here, here.) This is why they adopt their religious double talk, you're forgiven but it is not a forgiveness you actually possess. What many fail to grasp is that 1 John 1 is written for the Church, concerning the Gnostic sects attempting to infiltrate their ranks. 1 John 1:9 is inviting these lost souls who deny sin exists a way of escape. It is an evangelistic statement. It was never intended to be the Christian's "bar of soap" for any time they miss it. Look at what John even declared in the second chapter. Was John confused? Was he now adopting the religious double talk of you're forgiven but still need to confess it when you blow it? Rightly dividing the Word, we clearly see he was addressing the lost in chapter one and the Church in chapter 2. John agrees with the other writers of the Scriptures that we are completely forgiven. An illustration of this complete forgiveness may help you see it clearer. When you are driving in a vehicle and stop for a train crossing what do you see? You may see a few train cars directly passing you, but often times you can't see the whole train from engine to caboose. What if you were in a helicopter? Certainly, you would be able to see the first car to the last of any train. This is how God sees us. He saw our first breath and sees the last breath we will ever take. When we came to Him He took the sum total of our life from beginning to end and declared over us, forgiven. We are forever forgiven in Him. When He died on that Cross He took all of our sins away. He gave us total forgiveness. He didn't just forgive us partially or up to a certain point. Because of the Finished Work of the Cross we will never again be accountable for our sins. Jesus took the full punishment for all of our sins. We are forgiven once for all time because of that shed blood. Rest in the Finished Work. Enjoy this scandalous Grace. Revel in Christ who forever forgave us. No longer burden by sin consciousness, we can enjoy our relationship with our loving Father. We can rejoice in the good news that all of our sins past and present and future are forever forgiven. Yes, this is scandalous Grace, we are already forgiven for the sins we have yet to commit. We are complete in Him.